Subscribe to our mailing list for coupons delivered straight to your inbox! “I have been to over 20 stores and you have the best service. Came in on Sunday afternoon and was helped by an awesome woman. She answered my questions and had incredible knowledge. Led me to some great flower and extras, too! Told me about the specials and made me an instant regular. The staff was great. Ask to meet Opal... the coolest Boston terrier in the Rocky Mountains. A clean, safe friendly and CASH ONLY dispensary. I would recommend this place to anyone and everyone! I didn't get the budtender's name but she was amazing. Very welcoming and even more helpful! She helped me and my friend pick all the best strains and didn't have a problem answering all of my questions. Good variety of edibles, nuggets, concentrates, lotions, pieces and even sweet t-shirts. If you're in the area i would stop by. Durban poison was my favorite and she recommended cotton candy which was also good. I'm from out of state and this was my first trip into a dispensary. I can't compare it to anywhere else, but I had an incredible experience and wouldn't hesitate to go back. I loved the people and bud at High Q! I didn't get their names, but both the lady with long hair & guy with dark hair & a goatee were amazing and very helpful! The prices are fair, and the bud, superb! I will definitely be back! Happy Hanukkah! We've got 8 days of gifts for you. 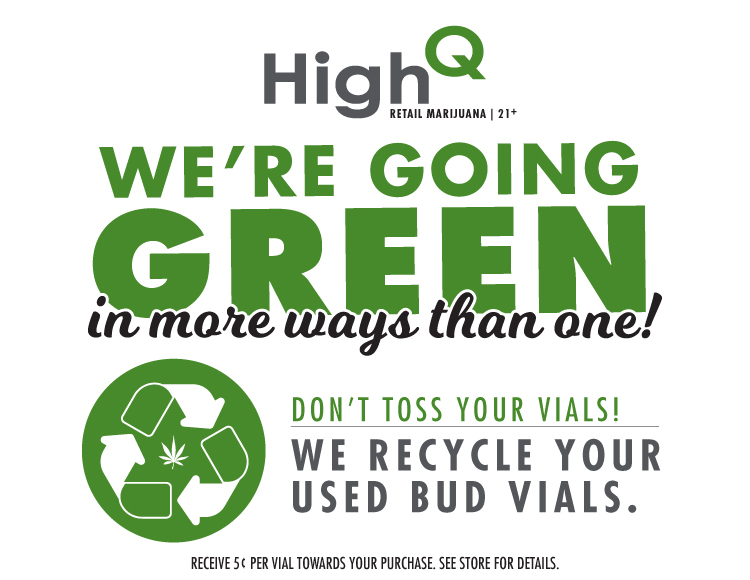 High Q is now offering loyalty points – earn points for every dollar you spend! See store for details. Veterans Day Deal - 30% cannabis items for Veterans! Limit 7g of bud, 3 infused products (edibles, concentrates, topicals) - Plus a FREE High Q lighter! Valid November 11-12 only. 👻 Have a happy and safe Halloween! 🎃 We have clean, organic, high quality treats for adults 21 and up, come see us in Silt and Carbondale. Available at High Q! . . . #Repost @stillwater.life with @get_repost ・・・ New product alert! Stillwater Brands Gummy Supplements are made with all-natural fruit juices and colors, are low in sugar, and most importantly: they’re made with Ripple! Each delicious flavor is infused with the same dissolvable THC/CBD Ripple formula that we know and love. We’ve got Blood Orange, Green Tea Mango, and Honey Lavender. Give ‘em a try and tell us what ya think! Halloween Special: Buy-one-get-one for a penny District 8 joints & blunts! *For adults 21 and over only.